The Cuaba Exclusivos is a very good option for a medium cigar that has both complexity and exquisite flavors. •	Great cigar for an afternoon break, not over powerful with flavors of wood, earth, nuttiness and some sweet characteristics. •	2 years of aging are recommended on these beauties. This cigar is simply deserves more publicity being a reliable smoke at an affordable price. The Cuaba Exclusivos looks very appealing at first sight. Its dark brown, almost chocolaty wrapper is beautiful, with minimal veining, and with a nice sheen of oil. It is smooth to the touch, with few minor bumps, and no soft spots; the cap is perfectly applied and is almost seamless. The roll and the construction seem perfect. The wrapper smells of hay and tobacco. The cold draw gives hints of oak, dry grass, leather, cocoa and tobacco. As every figurado cigar, due to their particular shape, it needs to be cut at the both ends, and once the cap is cut, it reveals a fairly tight draw but not something unmanageable. When lit, it is burning fine, just requiring a little bit of attention on couple of occasions, but nothing major. The ash builds up at the foot in a beautiful dome of medium gray color, that holds on pretty well, for about a third-long. It also produces plenty of light white smoke. The initial draw on the Cuaba Exclusivos gives a light creamy cedar flavor, plenty of sweetness and some notes of dried fruits. The flavor and the body of the cigar is right in the medium range at this point. And some more complex flavors also arise, some sweetness, of caramel, nougat, and ginger and some toasty characteristics, reminiscent of a spicy bread or a coffee biscuit. There is just a little pepper through the nose. The flavors evolve just a bit, with the ginger notes fading away, leaving more space for some rich roasted almonds. There are also flavors of earth, fresh green olive, leather and hints of vanilla. In the middle third, the sweetness disappeared almost completely, while some milk coffee flavors appears, along with some cake-like flavors. There is still the rich roasted almond flavor, while the dominant flavor is wood. The cigar strength is still in the medium range. In the final third, the flavors are getting more intense and richer, a nice fruity tobacco flavor is the dominant one at this point, alongside with some rich wood. There are also notes of deep black coffee with honey. This is a beautiful third, echoing the second one, only more powerful, the body is now medium-full body. It is enjoyable almost until the nub, there is almost no bitterness nor harshness. It also remains cool until the end. 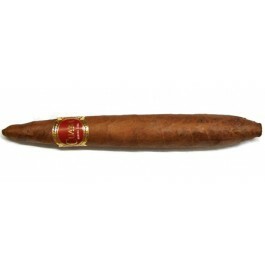 In summary, it is a cigar that worth more publicity, as it is of great construction and very interesting flavor profile.